Referred to as Australia's Sunshine State, Queensland is a state located in the north-east part of the country. The state shares borders with the Northern Territory to the west, South Australia to the south-west, and New South Wales to the south. On the east, the state is bordered by the Coral Sea and Pacific Ocean. 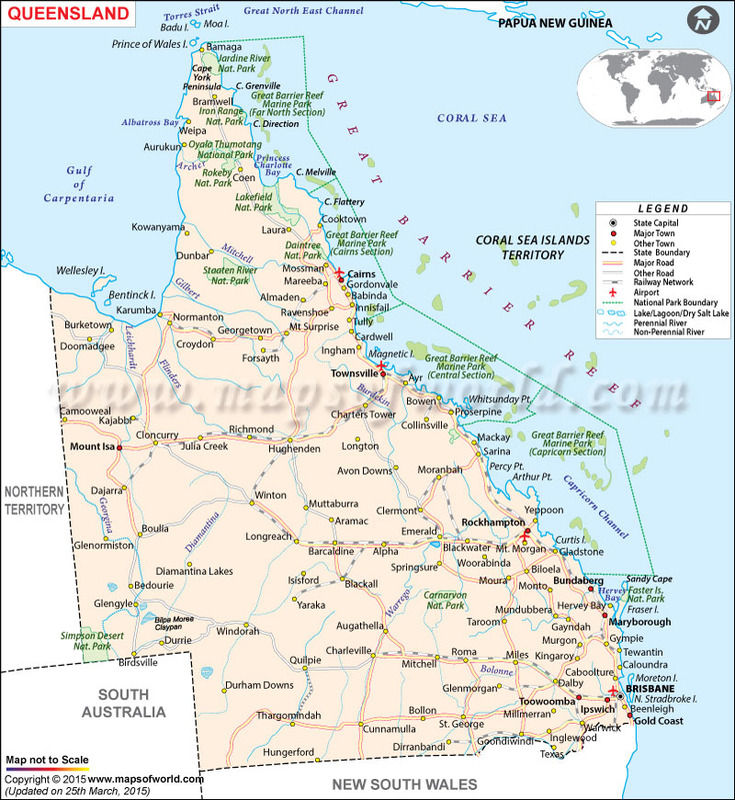 Covering a total area of 715,309 square miles, Queensland is the second-largest Australian state by area. As per the 2010 census, the estimated population of the state is 4,516,361; it is third-most populous state in Australia. Brisbane is the capital of Queensland. It is the largest city in the state with an area of 2,279.9 square miles. The estimated population is 4,516,361. The history of the state of Queensland goes back to over 40,000 years ago when the region was inhabited by indigenous Australians and Torres Strait Islanders. On June 6, 1859, the state was made a British colony. On January 1, 1901, Queensland was made a federal state. Women were given the right to vote in the year 1905. The government of Queensland functions in the framework of a constitutional monarchy. The Governor is the highest authority in the state. Penelope Wensley is the current Governor of Queensland. The Governor appoints a Premier who exercises all the executive powers of the state. Anna Bligh is the current Premier. The economy of the state is heavily dependent on tourism. Some of the major destinations that attract tourists worldwide include Brisbane, Port Douglas and the Daintree Rainforest, the Great Barrier Reef, Townsville, Daydream Island, Magnetic Island, Sunshine Coast, North Stradbroke Island and South Stradbroke Island, Hamilton Island, and Whitehaven Beach. Mount Isa, Cairns, Townsville, Rockhampton, Bundaberg, Maryborough, Toowoomba, Ipswich, Brisbane, Gold Coast.